Making smart decisions about incorporating lighting into your bathroom design can make a huge difference in the way you see yourself. With BeautyWraps bathroom lighting by Kichler, you can easily see yourself more clearly in the bathroom mirror. The side lighting incorporated into Kichler’s BeautyWraps eliminates the problem of dealing with the negative aspects of top mounted lighting. When your bathroom design features only top lighting above the mirror, all of your facial flaws are accentuated when you look in the mirror. The lines on your face look deeper, and your reflection is in shadow. “If you want to see your true self, and a more flattering self at that, then you need lighting on each side of your face,” explains Tony Davidson, president and CEO of Kichler Lighting. Kichler’s beautiful and elegant BeautyWraps fixtures provide the most flattering type of lighting for any bathroom design. Kichler BeautyWraps fixtures are easy to install, so it can be simple to improve the lighting design in your bathroom. Each fixture includes a top-mounted lighting fixture that comes with matching mini pendant lights on each side. It can be installed directly onto your existing top mounted light fixture. Brushed Nickel with Satin-Etched Glass or Tannery Bronze® with Umber Marble Glass, and Distressed Black finish with Sunrise Marble Glass. 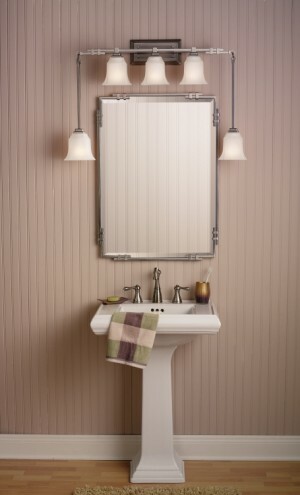 Kichler also has matching mirrors, making it easy to enhance your bathroom design with a fully coordinated look. For more information about Kichler Lighting designs or to find an authorized dealer in your area, see www.kichler.com, or call 800-659-9000.